An average beehive may contain up to 60 000 bees. It might be hard to imagine so many insects living in one place, the beehive. But, what makes the life of a colony easier is the division of work between different bees. Every individual bee has a specific role in the hive. Depending on the role of an individual bee, bees are grouped in so-called castes. A colony usually contains three adult cases: one fertile queen, male drones, and sterile female workers. How long does a bee live is affected by the caste of the individual bee and the time of the year. Most of the bees in the hive are female worker bees. The rest of the colony are drones, usually 200-300 drones. Drones have the shortest lifespan. Their only job is to mate with the queen during seasonal mating flights, and soon after they die. The average lifespan of a honey bee is around two months. But, their lifespan may be different depending on their diet, enemies, flying or stationary role, weather conditions or overall health. How long does a bee live on average is determined from the start of its life cycle, an egg? Being male or female bee drastically changes the lifespan of a bee. How long does a bee live is usually counted from the time it is a fully developed adult bee. Bees pass through four life stages: the egg, larva (larvae), pupa and adult. The process of growing from egg to the adult bee is called complete metamorphosis. The meaning of metamorphosis is that the form of a bee changes drastically from the larva to the adult. The queen lays eggs after her mating flights. She lays around 2000 eggs per day. Eggs are usually 1 to 1.5 mm long, about half the size of a single grain of rice. Eggs are laid in cells, one egg in one cell. Cells are built by worker bees. The egg gets attached to the cell by a mucous strand. The queen decides if an egg will become a male or female bee by fertilizing an egg or not. If the egg is fertilized, then the laid egg is destined to be a female bee, a worker or a queen. If the egg is not fertilized, then it is destined to be a male bee, a drone. The cells that contain female eggs are usually smaller than the cells containing male eggs. A freshly laid egg will stand straight up in the cell, by the second day the egg tilts slightly toward the bottom of the cell. If workers sense that something is wrong with an egg or if the queen has laid more eggs in a cell, they will remove the eggs. If the queen is missing from the hive, a worker bee might try to take her duty. The worker bee has underdeveloped ovaries, but she will try to take queens egg laying role. This can usually be recognized by cells having more than one egg, and by eggs not being in the center of the cell. The worker bees have shorter abdomens than the queen, so they cannot reach the center. If all eggs are becoming drones, then it might be a case of drone laying queen or a queen that has run out of sperm reserves. Which means that the queen cannot lay fertilized eggs required to produce worker bees. During this stage, the digestive system, nervous system, and outer covering are formed. The egg stage of development lasts only three days, and then the larva hatches. A larva (larvea) is a worm-like form that hatches from the egg. It is specialized to eat and never leaves its wax cell. The larva grows very fast in a five step development called metamorphosis. During that time the larva increases its size 1500 times. Adult nurse bees visit them around 10 000 times during their development. Nurse bees inspect and feed the larvae, and eventually also cap the cells. Nurse bees don't feed them directly; they just place the food in the cell. Three days after the larva is hatched, the distinction between worker bees and the queen is made. First three days all larvae are fed royal jelly, but starting with the fourth day only the queen is fed royal jelly. The rest of larvae are fed honey and pollen. The effect of continuing royal jelly is the prevention of development of worker characteristics. Before transitioning to pupa, worker bees enclose the larva by capping the cell with wax. The cell will stay capped until the adult bee emerges. The larval stage lasts about six days. The queen has the shortest larval stage, worker bees a bit longer, and for the drones it is the longest. When the larva is fully grown and filling the cell, it changes to pupa. In the pupa stage, the organism under the capping is starting to look like an adult bee. Its legs, eyes, and wings develop and, the little hairs that cover its body start growing. If the temperature of the brood nest lowers, the development may take longer. The pupa does not move and does not eat. Besides being contained by the wax capping, the larva in its last stage spins thin silk cocoon within the cell. 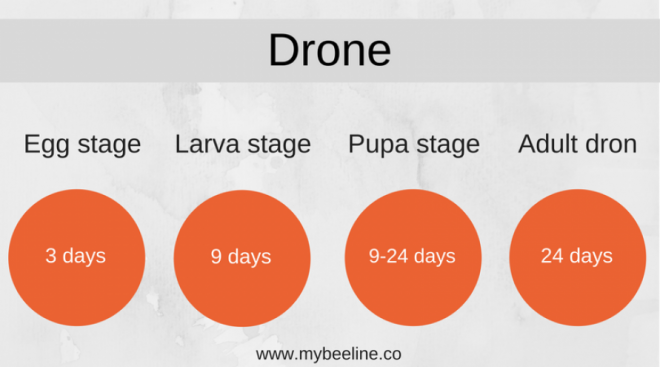 As with larval stage, drones have the longest, and queen the shortest pupal stage. After that stage, an adult bee is fully formed, and it chews its way out of the cell. After emerging from its cell, an adult bee moves away from the cell. Worker bees clean the cell, preparing it for the next egg. The adult bee goes out of the hive for forage and to eat. The counter of how long does a bee live starts now. Depending on the caste in a beehive, bees will have different lifespans. Read More Why Do Bees Build Hexagonal Honeycomb? Honey bees are social insects, living in sophisticated, well-organized colonies. The organization and success of the colony rely on three main roles in the colony: the queen, worker bees, and drones. Thanks to such organization they are very efficient and work well together, even in colonies with very high number of bees. The well-being of the whole colony is dependent on how well bees work together. How long does a bee live is heavily dependent on which role it has in the colony. With different roles also comes the division of work and different risks. Stationary bees, bees staying in the beehive, may have a longer life than bees flying out of the beehive. Bees flying outside are at higher risk of being killed by many enemies, such as hedgehogs and frogs. Also, they are at risk of dying from exhaustion while carrying nectar or pollen, especially if they get stuck in tall grass or bushes. It’s important to note that the numbers mentioned below are common but can vary depending on many factors and conditions. The queen has the longest lifespan and can live up to seven years. The queen also hatches from the unfertilized egg, same as the worker bee. The only difference between workers and the queen is their diet. The process of producing a new queen is called queen rearing, and it is performed by worker bees. During the stages of their larval development both are fed "royal jelly," but later worker bees get different diet. Queen bee is fed "royal jelly" during the whole larval stage. The royal diet consists of three stages. In the first stage, larvae are fed white fluid produced by the mandibular gland. On the fourth day, they get the next stage of the royal diet. It involves a half-and-half mixture of secretions from the mandibular and hypopharyngeal glands. During last two days of the larval stage, honey is added to the queen's diet. The addition of honey increases the content of sugar, and levels of a hormone known as a juvenile hormone. 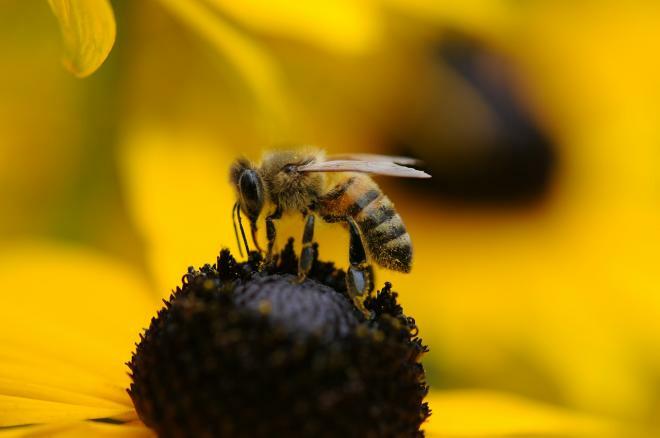 This hormone affects the development of the bee's body. Activates the production of proteins and hormones that influence the development of the queen anatomy. The newly hatched queen bee is known as a virgin queen. After hatching her highest priority is to eliminate other queens. She kills the existing queen and larvae that should develop into queens. Six days after hatching the queen leaves the hive for mating. During her mating flight, she will mate with 20-30 drones. After filling her sperm sack, spermatheca, she goes back to the hive. Once she gets back to the colony, she won't leave the hive unless the colony is swarming. Worker bees are female bees hatched from fertilized egg. After hatching the bees spend six days as a larva. First few days of the larval stage they are fed "worker jelly," a mixture of fluids produced by the glands of an adult worker bee. After three days, larvae diet is changed to less rich content, and they are fed less frequently. After eight to nine days, the brood cells are capped, and larvae spin a cocoon with silk produced by their glands. This marks the start of the pupal stage, during which most parts of the adult bee are formed: wings, abdomen, legs, internal organs, and muscles. 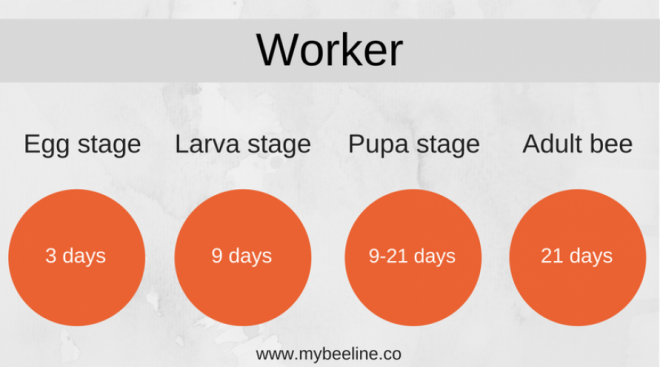 During the pupal stage, the pupa gets resources from fat bodies of built up during the larval stage. Using stored lipids, amino acids, and glycogen fuel they continue to grow and develop. After about 20 to 21 days, the pupae emerges from the cell as a general or callow bee. Freshly hatched bees don't leave the cell for another three to four hours because of having soft skin, which takes time to harden. How long does a bee live can be determined shortly after this last stage of the development. After leaving the cell, the bees have to feed within a few hours. Bees have to ingest pollen to get the bacteria and proteins necessary for the development and longer lifespan. If they don't manage to find food, then they will die. After three weeks of life inside the hive, the glands that produce food for the larvae and wax degenerate. That way the bee begins its life as a forager and goes out of the beehive. Drone bees make 15 % of the colony population. They are large and can be differentiated from the queen by the tapered shape of their abdomen. Drones hatch from an unfertilized egg, and during the larval stage, they are fed increased quantities of pollen and honey. Four days after drone cells are capped. Their cells are different from other cells, having increased size and dome-tipped shape. New drone bees are fed a combination of honey, pollen and brood food from nurse bees. Nurse bees feed drones until they are mature enough to feed themselves from the hive honey stores. Adult drones don't serve any function in the hive, they never collect food, feed the young, or secrete wax. They are not beneficial for the function of the colony, an only waste resources. They have no defense mechanism as they lack a stinger, and also don't have a long tongue for nectar collection. The drone has only one purpose, to mate with the queen and offer the diversity of genetic material. The first time drones leave the hive is six days after emerging from the cell. They fly to the areas known as drone-congregating areas and only return to the hive after failed mating. Drones that were successful in mating with the queen die soon after mating. The average lifespan of the drone is eight weeks. Worker bees tolerate them while resources are plentiful, but they will be killed or kicked out if the food is lacking. As the fall is coming closer, the workers usually kick out drones, so they don't waste resources during winter. How long does a bee live depends on many factors. The cause of death can a lot of times be of natural causes. From being eaten by some animals, being killed by another bee, to simply dying because of overwork. But, the biggest threat to bees is their susceptibility to various diseases and infections. They can greatly reduce the lifespan of a bee, even destroy the whole colony. An article published in the Public Library of Science describes the threat from the parasitic fly Apocephalus borealis. It causes bees to leave the hive and die, after which fly larvae emerge from dead bees. Another threat from that fly is that it brings deformed wing virus. Furthermore, another great threat to bees are pesticides, habitat loss, and mites. Insecticides applied to seeds contaminate the pollen that bees take to the hive. Also, overuse of pesticides can kill bees in the field. Sometimes the worker bees disappear and leave the queen and immature bees, that is known as colony collapse disorder. The scientists have yet to find the cause of it. The lifespan of the bee is also affected by pollen consumption, the amount of protein, and the bee's level of activity. Queens spend their lives laying eggs inside the hive and could live for several years. Workers who work outside during busy seasons cannot survive that long. Bees are amazing and very interesting animals. They live in very large colonies, yet, they are organized very well. The well-being of the colony depends on every bee that is a part of it. A part of their life that rises interest is also the way they develop to an adult. At the start of their lives, all bees start as an egg. But, further development varies depending on what role that individual bee will carry in the hive. The queen and the colony decide on what role is most needed at that moment and act accordingly. The queen decides if a new bee will be a male or female, and worker bees decide if more worker bees are needed or a new queen. With being born for the specific role a new bee already has determined longer or shorter lifespan. 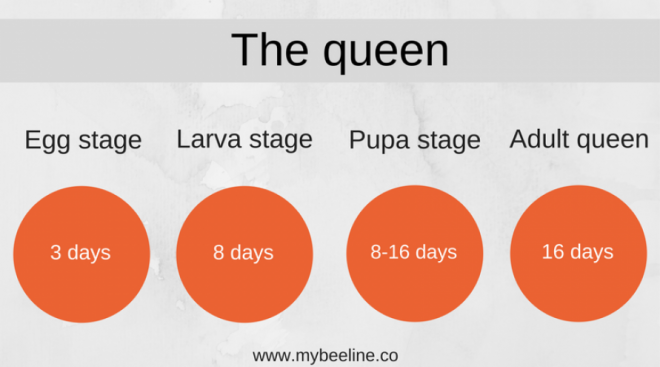 The queen always stays in the hive and is well taken care of and protected, so her lifespan is the longest. Drones have the shortest lifespan simply because they have only one purpose in the beehive, mating. The life of worker bees depends on the weather, time of the year, dangers outside of the hive, and many more factors. Bees on average have a short lifespan, but during that time they do a lot of good things. They make delicious honey and pollinate many plants. Without bees, we would not be able to enjoy watermelons, cucumbers, pumpkins, blueberries, almonds, apples, cherries, and much more.